Imagine if while walking down the street, you turned the corner and witness a car theft taking place. Being the good citizen that you are, the HTC Android phone instantly gets whipped out of your pocket to alert the police of a crime in progress. But the action is over in seconds and the suspect starts the car, peeling off around the corner. Did you remember the license plate? What kind of car was it? According to the FCC, the public will soon be able to forgo the traditional 911 phone call, which ideally connects you to an operator, and instead send emergency personnel text messages, photos, and even videos. It's part of what the Federal Communications Commission is calling Next Generation 9-1-1, or NG911. The implementation of IP-oriented emergency response will be a breakthrough in cutting down response time, increasing contact capability, and ensuring every attempt to reach emergency personnel can be made in any situation. According to CNN, FCC Chairman Julius Genachowski became devoted to the idea in the wake of the 2007 Virginia Tech massacre, where students were unable to call 911 for fear of alerting the shooter to their presence. 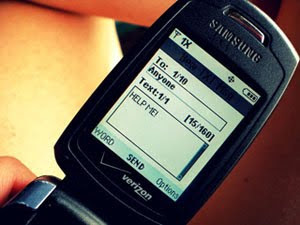 The ability to instead alert emergency personnel through text message or other means can help those restricted from speaking still reach help. In light of the fact the an overwhelming majority of those under the age of 25 use text messaging as their predominant means of communicating, it makes absolute sense. Those under the age of 25 are also the demographic statistically most likely to be involved in vehicle collisions or be the victims of criminal action. The FCC's authoritative stance on the issue stems from federal fears that local authorities will straggle in the effort to make their emergency services essentially web 2.0. FCC officials are concerned that a failure to initiate NG911 on a national scale will result in a sporadic and untrustworthy system. Someone living in one city where NG911 is quickly utilized might not be aware that another municipality hasn't yet switched from strictly phone-based emergency assistance, and in the event of an emergency, that could have lethal consequences. But the overarching issue is that there's no reason why our emergency service access shouldn't evolve with the interconnection of mobile communications devices. The ability to take a photo at the scene of a crime and therefore provide law enforcement with precious evidence that can be instantly sent to the nearest patrol is remarkable. The idea that there could somehow be a struggle to transfer the nation's countless 911 call centers is unbelievable. It could almost be considered a crime.